Meanwhile... enjoy the picture of clouds to the right (click on it for the larger version). 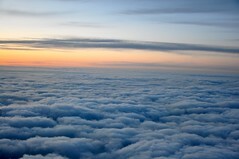 I took that with my Nikon D90 out the window of one of the many planes I've been on lately. Wow! DisruptiveConversations.com looks quite horrid on the iPhone! Well, I admit that I didn't quite realize how horrid this site looks on an iPhone. But when Ryan Schoeffler tweeted me such a message, I knew even without looking what was wrong. You see, back in 2006, TypePad, who I use for hosting this Disruptive Conversations blog, Disruptive Telephony, Blue Box and a few other blogs, didn't have the range of layout options I wanted. Specifically, they didn't have the three-column layout with a main column on the left and 2 sidebars on the right - and that was what I wanted. So, not having an issue diving into code, I hacked on the site. I dove into TypePad's "Advanced Templates", learned the language, learned the structure and built off a TypePad Hacks post from early 2006... all to build the template for this site and for Disruptive Telephony. It worked very well. John Unger over at TypePad Hacks even gave me an "AHA! Award" for my redesign. However, it was a hack. And sometimes... hacks break. And so it was that about a year ago, I had to re-style Disruptive Telephony after one of my posts completely broke the layout. By this time, TypePad had come out with an "official" layout of "3 columns with a big col on left", and so I moved DisTel to that layout. The good news ever since was that not only did the layout no longer break (and the few remaining IE6 users could read the site! ;-) ) but that also I could make use of new TypePad developments which were not easily available to users of their "Advanced Templates". I need to make the same move here on Disruptive Conversations. Maybe this week... maybe next... but yes, iPhone users (and I am one myself), I hear you. Thanks for caring enough to tell me. As I mentioned previously, I have decided to experiment with an email newsletter. The first version went out last Thursday night, November 5, 2009, at around 11:42pm US Eastern time. If you didn't sign up, you still can... for a number of reasons I am not creating a web archive (yet, anyway) of these newsletters, so you only get it if you have signed up. I'm toying with creating an email newsletter - care to sign up? to try to tell the story of all the changes that are going on all around us in both the way we communicate and also the tools we use to communicate. That theme is here on Disruptive Conversations, over on Disruptive Telephony, in Blue Box podcasts, in my Emerging Tech Talk video podcasts and definitely also in what I write on Voxeo's blog site. It's also a theme in some of what I post on Facebook and Twitter, too. Major pieces I've written or produced somewhere in my network of sites that I think would be interesting to a larger audience. Updates on upcoming conferences where I'll be speaking and where we might be able to meet. New projects or initiatives - or other bright, shiny objects I'm chasing. New tools I think people might find useful. Random personal updates or other notes. It also, quite frankly, gives me a chance to experiment with iContact, a service I've been wanting to try for a while. I'll probably be sending out the first newsletter in the next week or so. Being the security/privacy nut that I am, you can be sure I won't sell your name or do anything like that. That's not my style. If you do sign up, thanks for doing so. Thanks for your note. We are currently working on a known issue with comment spam, and we will have this rectified very soon. We apologize for any inconvenience that this may cause! Hopefully they will have this fixed soon. Unfortunately, I have had to move this blog to moderating all comments, which I really did not want to do. I like having unmoderated comments because: 1) the comments appear quickly; and 2) there's no interaction required on my part for the comments to appear. I've been running the blog this way for a couple of years now - with just requiring a CAPTCHA to defeat automatic comment spam bots - but for whatever reason that approach is no longer working! Within the last day alone, I've had about a dozen spam comments get through the CAPTCHA and wind up being posted on the site. I don't know if some spammer out there has figured out an automated way to defeat the CAPTCHA that TypePad is currently using, or if they are paying actual people to answer the CAPTCHAs so that the posts are posted, but whatever the case I'm sick and tired of both having the vile stuff on my web site and also in dealing with reporting the spam and getting it off my site. So I'm still going to require the CAPTCHA, but I'm also going to moderate all comments. I'm going to keep monitoring the flow of comment spam and perhaps at some point soon I can turn off moderation and let the comments just start flowing again. If anyone else at TypePad is having this problem recently, I'd love to hear about it. Please do leave a comment and I'll approve it as soon as I can. Thanks. Finally getting around to updating my home page..
After getting a second phone call of someone offering me a job because they had read on www.danyork.com that I was out of work and looking for a job, I finally got a chance to update the main page. In part the delay is a case of "the cobbler's own shoes". My web site has been online since 1996 and desperately needs to be updated on a technology end (you'll note that I don't have domain mapping set up, so danyork.com actually redirects into my lodestar2.com site). I just haven't made the time to do so. That was actually on my list of things to do if finding employment took a while, but then I landed rather quickly at Voxeo. So the main page of the site is updated - and comments or opinions about what I wrote on the page are welcome. Before I had a pseudo-resume... now I changed it to talk a bit more about who I am.